It’s Not a Record…It’s an Experience! Yesterday I got an order in the mail of an old record. The mailman, in the 106 degree heat, hand-delivered the box labelled “vinyl record, fragile” to the door. “Me, too,” said the mailman, who said he used to work for a distributor in the days when vinyl was king. Now he delivers them to the proud few who listen to the needle and groove in the mail. I’ve made no bones about the fact that I still listen to and have vinyl in my household. But I don’t do it because of the reasons so many people do. It’s not because vinyl is so much more vivid and dynamic than an iPod. (That’s true, though, by the way) It’s not because vinyl has a richer tone and many of the old albums were mixed for vinyl, not iPod or CD. (That’s true, too, by the way, and also why so many sound odd on CD or iPod) It’s not even because it’s the cool, hipster vibe that gets people to cringe at you when you arrive with your massive bushy beard reminiscent of a member of the 5th infantry division of the US Cavalry displayed in a Ken Burns Civil War episode. No, I don’t do it for shock value or crazy indignant ego. I put it that way because it, too, is true. This gives you part of what music on records was and is for me. It’s not a record, it’s part of your life, it’s an experience. Vinyl isn’t just vinyl…it’s part of your life, and experience you lived. I remember saving up money and going to the store to flip through the new releases, looking for that one record, that one musical experience, that I’d been dying to hear. As a little boy my Dad worked in a chain store much like Target or what have you. He’d get first crack as the LP’s came out, I guess, because he came home with new music a lot. When I was little I remember going to a store in a larger town and buying an entire stereo system that we then took home and hooked up. After that, my father bought new records as they came out. 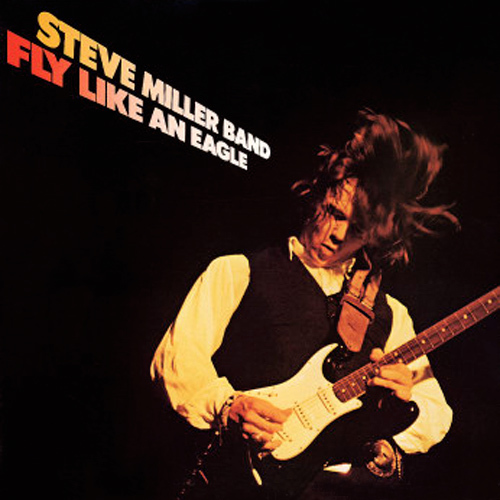 I remember the day he brought home Fly Like an Eagle by the Steve Miller Band. We put it on the turntable and listened to it. I spent weeks walking around singing “tick, tock, tick doo doo doo doo!” I stared at the photo of Miller, face invisible, covered by hair, playing a left-handed Fender Stratocaster. I was enamored. 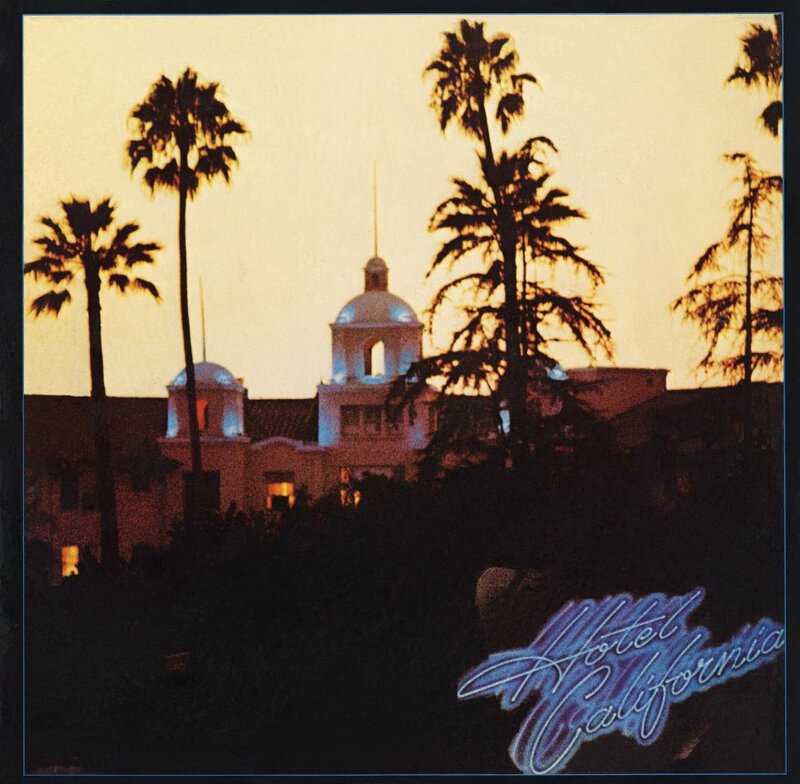 When Hotel California came out we took it out and put it on the turntable. The opening salvo of the twelve-string guitar filled the room. It had a gate-fold album cover with an atypical Los Angeles scene, a hotel on the cover, and the neon sign you only pictured as a little kid must be what LA looks like. A new record was an experience from the beginning. You went to the alphabetical bins filled with records. You flipped through the albums there, looking for bands you knew. You made it to the one you wanted, bought it, got home, and couldn’t wait to tear the cellophane off and see the artwork and the label. 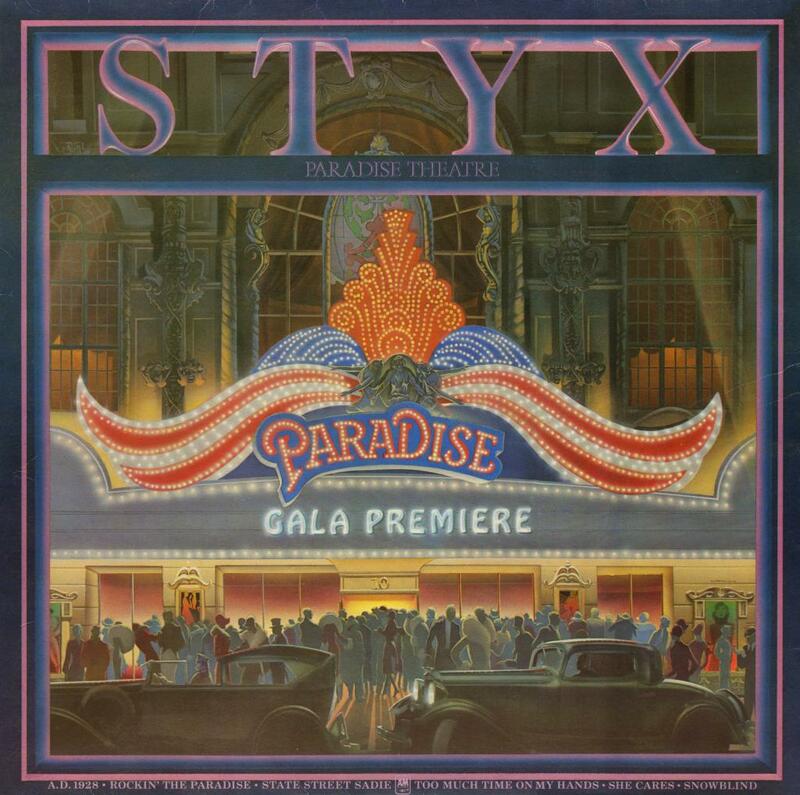 When I was a teenager STYX had a record called Paradise Theater that had an amazing artistic representation of what the same said theater looked like in the heyday and what it looked like, decrepit, dying, just before it was torn down. 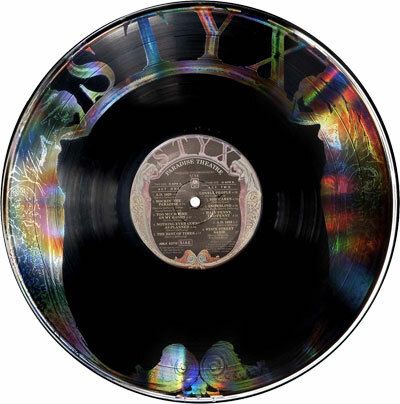 Inside you got the lyrics and screamed along with Tommy Shaw as he said he had “too much time on my hands.” But the capper: the laser-inscribed cherubs that bordered the edges of the actual vinyl…rainbow shadows enhanced by the light, the only things decorating one side of the vinyl. For effect, they removed the record label from that side so it was all-black but for the laser etching. The other side had the listings of the songs for both sides of the LP. My favorite, though . 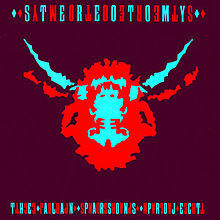 . . was by the Alan Parsons Project. 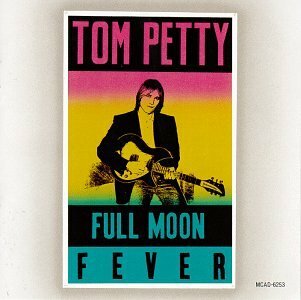 The album is universally ignored, not critically well-received, and I loved it. It’s very ’80s, it’s very keyboard-centric, and it’s an odd high-concept album. But the album artwork . . . it’s AH-MAY-ZING! If you were lucky enough, as I was, to get a copy of one of the first pressings it was an album that was encased in a PVC cover that was then wrapped in cellophane. Take off the plastic and the PVC was blue on the front . . . red on the back. 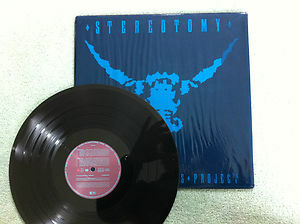 All the front said, in seemingly green letters, was “The Alan Parsons Project” on the top and “Stereotomy” on the bottom. The back had an odd, crystalline design and nothing else. Open the flap and take out the album cover, though, and the front is gibberish with a larger design in red and blue. The back showed the actual track listings. The album used the old 3D glasses effect to erase portions so you could only see them with the PVC cover on. It was radical, had to be expensive, and just…so…cool! This is the experience. The act of taking the vinyl out, flipping it over and over again in your hands, and putting the center hole onto the spindle of the turntable. You smelled the vinyl and the cardboard on the records. You read the liner notes as the record started to play. After all that, even, you played the record and you were cognizant of the music flowing through your room. When it stopped, you got up, moved across the room, and moved flipped the record. You cleaned it to remove the dust and grime, pulled over the needle. . . and you listened to the other side. I have most of my record collection at home. I have more new vinyl I’ve purchased. I’m no throwback, I have an iPhone. I listen to music in the car, on the iPod, I use it when I exercise in the mornings. But music is meant to be experienced. To that end…my kids tend to pick vinyl over CDs or the iPod when we choose music for the evening. They look at the album covers. The latest one by Rush has each side of each record is a clock…showing the album side from 1 to 4 by showing the time on a clock…for the album Clockwork Angels. Others have clear or colored vinyl. I have jazz…a Dave Brubeck small microgroove LP from Record Store Day that is all red see-through vinyl. The music is amazing and the vinyl looks like a clear old 78rpm record. It’s meant to tell a story before you ever put the needle on the groove and hear the first notes: this is a history lesson to what music was, can be, and should be. It’s from the ’78 era but re-thought by Brubeck for the then 20th century. We are missing the experience today. Kids, sure, listen to music and go to concerts. Still, in an era where auto-tune is the norm and perfection is the preference, isn’t it amazing that four kids in a California household will listen – voluntarily – to a vinyl record. There are pops, hisses, the occasional skip and none of it is auto-tuned. I have new acts, like the Black Keys and OK Go along with my old Brubeck, Miles Davis, Clapton, Bonnie Raitt and Allman Brothers. 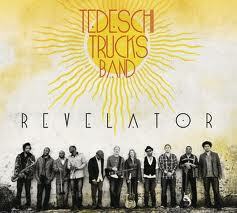 Tedeschi Trucks mixed a version for vinyl and then added free digital download of the “mixed for iTunes” version. It’s brilliant. As Jimi Hendrix so aptly asked . . . “but first, are you ex…perienced?” I have to ask you, before you call me a fuddy-duddy, or old, or grumpy or just too set in my ways…have you ever been experienced? Well…I have.